A gun range in Beaver County, Penn., has installed a ammo vending machine. The machine dispenses a wide variety of handgun ammunition. "The machine sells pretty much everything," owner Sam Piccinini told the Beaver Countian. "From .22 long rifle to .45 Long Colt and every standard caliber in between except .32 and .25 automatic. It’s got 380, 9, 38, 40, 45, .357 SIG. I manufacture all of it myself." The machine dispenses jacketless forms of the ammunition as the Beaver Valley Rifle and Pistol Club bans all jacketed ammunition on its range. 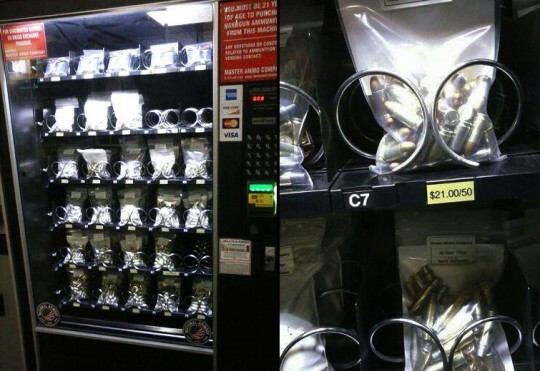 Since jacketless ammunition is far less common, the range allowed Piccinini to install the vending machine on its premise to make things easier on its customers. The machine is located behind locked doors that require a digital key fob to open. Those keys are only available to members, who must be 18 years or older. Despite this regulation, the Beaver Countian has received anonymous complaints, and a Federal Bureau of Alcohol, Tobacco, Firearms and Explosives Special Agent the publication contacted expressed skepticism about the practice. "I don’t want to speculate as to what is or is not happening in this particular situation, but a licensee can not sell ammunition to anyone under the age of 18, and importantly you can not sell handgun ammunition to individuals under the age of 21," ATF Special Agent Stephen Bartholomew told the paper. This entry was posted in Culture and tagged Gun Control, Guns, New Gun Laws. Bookmark the permalink.